Sorry for the late update, but it’s been that kind of day. Only good stuff, though! First, I want to thank all of our Backers who bought our goods during the pre-sale. As we’ve been saying would happen, the pre-sale period ended today. You can still, of course, buy our goods at the store, but the initial pre-sale discount has ended. However, you will still get the bundling and shipping discount! Our partner, Merchline, is ordering the goods, and printing of the goods will begin shortly. They are expecting great things from us going forward, and are very pleased with the response so far. Secondly, we revealed the eighth class trio, and it was the Spirit Mages! This is one of the darkest trios of any of the reveals, and one of my personal favorites. More information about them can be found here (http://camelotunchained.com/v2/class-reveal-spirit-mages/). The entire reveal can be found here (https://www.youtube.com/watch?v=vt7s4aiRlbk). Thirdly, it was a great sprint for us, with 16 old cards with 38 completes and 4 new cards with 29 completes. As a Backer, I’d like to test the new female luchorpan model. As a Backer, I’d like a UI that is easy to develop mods and themes for. As a Backer, I’d like to experience positionally-based audio and music within the world of Camelot Unchained. 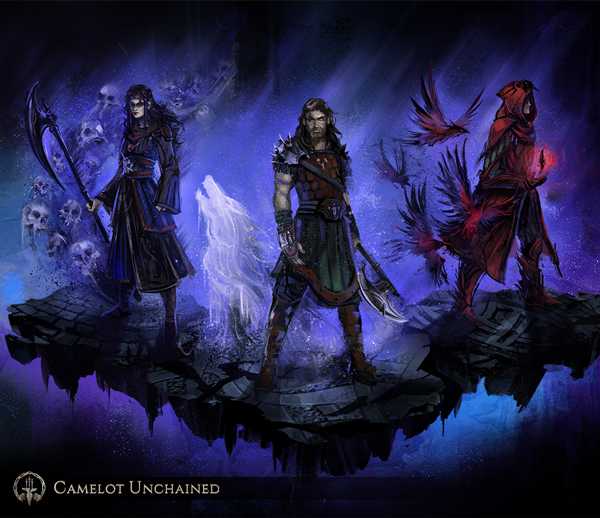 As a Backer, I would like to have information about the classes of Camelot Unchained. As a Developer, I’d like to improve some of our fundamental tech to improve client performance. As a Backer, I’d like to test the male Pict model. As a Backer, I’d like to test the female Pict model. As a Backer in Beta 1, I’d like to have a sampling of light, medium, and heavy armor that can be worn in the game. And here’s a bit of breaking news that didn’t get into the user stories. A few minutes ago, we successfully loaded our first “large map” into the game. This map is sixteen times as large as our current map. I’m going to send out a message to all our Alpha and IT folks to join us this weekend in testing this new map! In other news, this week you watched as Sandra livestreamed (https://www.youtube.com/watch?v=NQFFTHmQMSA) a new piece of concept art, which appears below. The subject of that art is a new human race for the Arthurians: the Picts. They are also the subject of a new Becoming™ story (the first I’ve written in a while), that I’ve attached below this update. And the good news continues! We are holding another Friday Night Fights this weekend. Lots of technical improvements, and hopefully things will go very well this weekend. Our testing during the week was a success, and hopefully that will continue over the weekend. 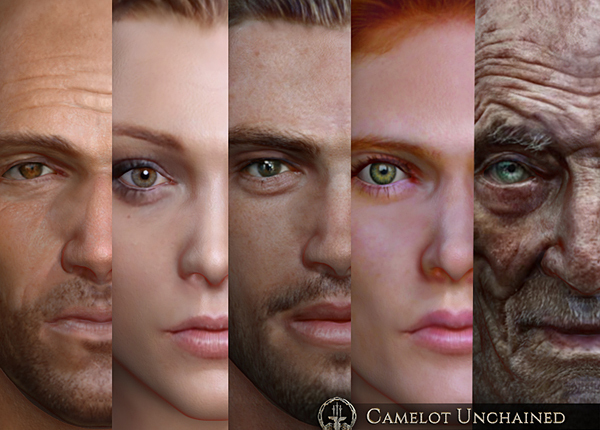 In our final piece of art for this update, here are some of the faces that Jon has been working on for our game. He took pictures of several team members, which he used for beard stubble. I would say that they are pretty great, but since I was one of those team members, well, that would be a bit conceited. The Becoming story I mentioned is attached below. While the Picts had remained hidden for these many generations, they had established a very effective network of spies and friends, who kept them informed of the doings among the three Realms of this world. In exchange, the Picts provided shelter to many a lost people, including those known as Goblins, and shared some of the treasures from under their mountains. He quickly released Drest from the mind-share, but asked him to stay close in case he was needed. As Drest flew off looking for a tasty meal, Brude was left by himself on the top of mountain. Tagged 2015, 20th, Camelot, Evening, Friday, November, Unchained, Update.